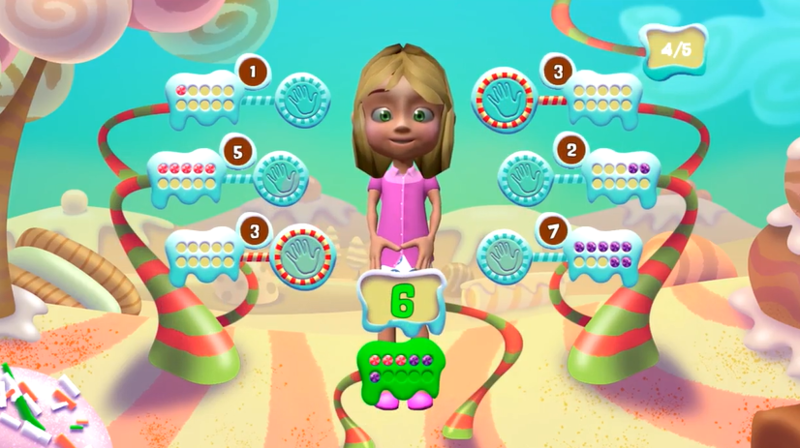 The child entering into a colorful world of candies, selects the desired avatar to control and tries to match pairs of either numbers or quantities that compose a target number by stretching both hands to reach the two sub-parts. In a joyful and yummy environment, the child advances mathematical thinking and hand eye coordination. The teacher/therapist can select the range of target number that the child will be asked to make (up to 100) and the difficulty level that concerns the available pairs of numbers from which the child will be asked to choose. Candy game offers unique learning and motoric experiences to the children about how numbers can be broken apart and put back together. In the “Yummy Pairs” game, the child can advance skills in decomposing numbers that appear as positive integers or quantities using the ten-frame representation, and improve, at the same time, bilateral coordination skills by trying to make symmetrical hand movements.